With a civil partnership, you can quite literally create your own ceremony, from the readings and vows to your choice of music and song that's special to you. Our professional singers can fill the venue with glorious singing as you and your partner enter, perform a solo or duet during the ceremony, entertain and delight you and your guests during the signing of the register, and then sing you both out in style at the end! See our wedding music page for suggestions for civil partnerships ceremony song, but remember that civil partnership ceremonies must not include any religious music. Do feel free to contact us to discuss your requirements and ideas. 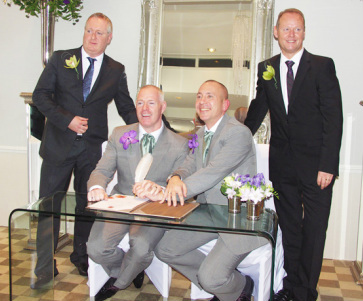 When can I have music during my civil partnership ceremony? Before the ceremony starts and as your guests assemble, you might like to have music playing in the background. We don't generally advise singing at this point, as most guests want to chat and greet each other, and don't want to have to talk over us! During your ceremony, you can include solo singing at any time. The most popular point for music in a civil partnership ceremony is during the signing of the register; when you're busy with the paperwork, we'll delight and entertain your guests with your choice of special music. When the ceremony is complete, we can sing as you process out as partners for life. Can I have both recorded music and live singing at a civil partnership? Do I need an organist or piano player? Can you sing anything at my civil partnership ceremony? Much as our bank manager would like us to say 'yes', we are classically trained singers and not the next Madonna, Adele or 50 Cents! Our advice is that you like a song regardless of who sings it, ask us about it. If you like a particular artist singing it, then play their version on CD. How much music can I have at a civil partnership ceremony? Wedding ceremonies in a registry office are allotted a certain time, and you'll need to allow some of that time for guests to enter and sit down, and for you and your guests to exit at the end. So, your chosen songs, music, readings, vows, etc, need to fit into the time remaining. For example, even if your ceremony time slot is 'officially' 45 mins, your registrar will probably advise your ceremony lasts no longer than 30 minutes in total. Civil partnership ceremonies held in a register office usually have a maximum duration, usually 30 minutes for the ceremony and 5 minutes or so for entry and exit. Civil partnership ceremonies in registered venues such as stately homes or hotels can be longer, although the final timings depends on how long the registrar is present, usually up to 45 minutes.